The IKRA was built in 1964 to participate in the IXX Competition of the Livingston Brothers, in order to have a second British championship contender. Her architect, David Boyd, designed her emulating the characteristics of another racing boat, the Sovereign, but with slight differences in the keel and the rigging. Finally he got a faster Ikra than her older sister, thanks to her Hood Sails, which were banned in competitions unless they were made in Britain. In 1976 she was renamed as Ikra II, when she set the port in Antibes (France) and her mast, boom and interior design were modified. 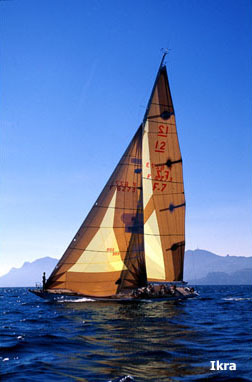 This yacht is known have started in 1981, next to the sailboat Orgullo, the popular French regatta Les Voiles de Saint Tropez, initially called The Nioulargue. Since 2006, she belongs to Yves Marie Morault and she has undergone major refurbishment works in Antibes.